Mom, Wife, Business Owner and Blogger with a love for crafting, party planning, Disney and anything that sparkles. I have a Masters degree in Marketing and am obsessed with all things social. Owner of Party By A Princess which specializes in custom made party printables and princess party fun. Co-founder and contributer for DIY Disney Days, a blog focused on tips, DIY tutorials and advice for doing Disney with a baby. ‘Tis the season….to throw the perfect party! Check out this adorable Elf on the Shelf themed North Pole brunch hosted by Girly-Girl Partea’s. I just loved having the opportunity to craft these unique printables! Learn how to make your own NORTH POLE sign at the bottom of this post. NORTH POLE TUTORIAL: To make the North Pole I recycled an old shipping tube, though wrapping paper rolls or PVC pipe would work too. I spray painted the base color (silver) and then wrapped ribbon in different colors (using hot glue to attach it). I pushed the bottom into a styrofoam block I purchased from the Dollar Tree and then covered the block of foam in Modge Podge and sprinkled fake snow and some iridescent glitter on top to give it a frosty shimmer. I made the ‘North Pole’ sign and glue it to the pole. The top is actually a plastic Snow Globe from Hobby Lobby (the ones you can insert a picture in and design yourself). I filled it with some gold tulle and battery operated lights I found in the dollar section at Target. My tube was actually the perfect width for the globe base to sit in nicely. A clear ornament would work too with any size tubing. That’s what I used for the top of the directional sign. This adorable girl power, Wonder Woman inspired party was hosted by Girly-Girl Partea’s, with printables by Party By A Princess. This party theme is the perfect way to include boys and girls and create a unique, memorable experience for the birthday girl and her guests. Scroll to the bottom to see our mini tutorial on how to make superhero cuffs for your guests for next to nothing! *PARTY TIP: cut toilet paper rolls in half (one roll per child) and then spray paint them silver or gold. Have guests decorate them with stickers and then wear them as superhero cuffs! Easy, thrifty and fun. This mermaid themed party by Girly-Girl Partea’s using our printables is absolutely perfect! The purple and teal really sets off this beautifully decorate party. Although Sleeping Beauty is one of the rarely booked princesses, she still merits a beautiful gown! When a good opportunity presented itself, I just couldn’t resist. The dress is from Angel Secret, purchased NEW from a separate seller on eBay for nearly half of the cost new. The tiara and necklace were made using foam sheets, gold paint and crystal rhinestones. You can purchase a set of your own from our Etsy store. The wig is actually a restyled Barbie wig I had in the costume closet. A few curls, some bobby pins in the bangs and ta-da! I would love to hear your thoughts in the comments below. It’s the little touches that really set a party over the top! Here is the inspiration for this project, Seahorse Straw Decor. These were made using a 12×12″ sheet of aqua glitter scrapbook paper (cardstock is preferred) and my Cricut Explore machine. Copy and paste until you have the number you need. Use the included tools or a razor knife to gently separate the paper. Finally, use paper straws (purchased from Michaels for $1.00) and a hot glue gun. Place one dot of glue near the head of the seahorse and wrap the tail around the straw. Place in cup and enjoy! The Dollar Tree is my absolute favorite store. So many wonderful items for such a cheap price. It is my go to for craft projects and party decor. I’ve found so many items that would be perfect for a fairy themed party. No fairy party is complete without dress up clothes for the guests. 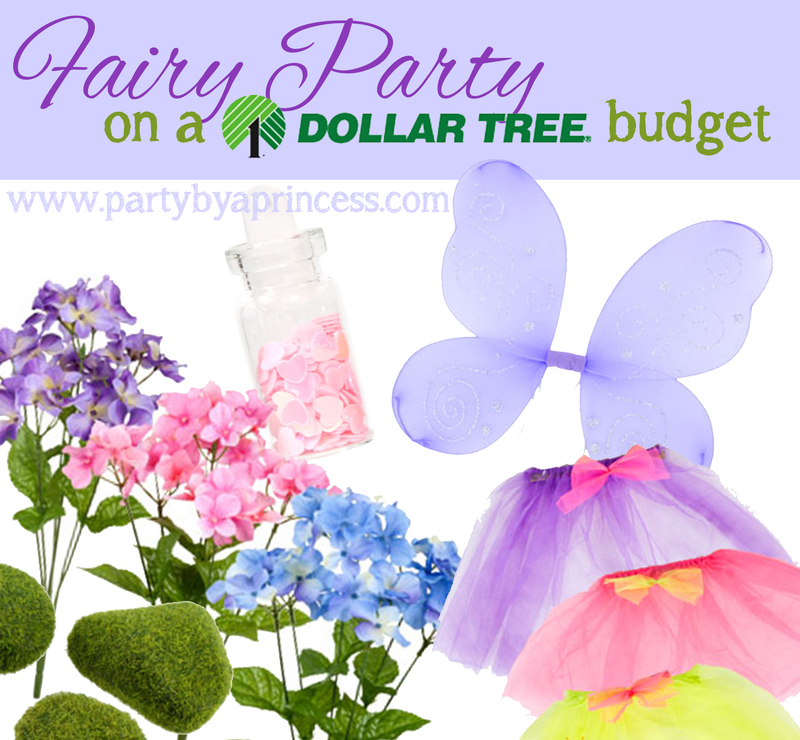 The Dollar Tree has fairy wings, tutus, tiaras and wands, all at an affordable rate. Altogether, you can expect to spend $3-5 per guest and give them a complete outfit to take home. Activities for the kids are also incredibly important when planning a party. Once your guests are dressed in their fairy attire, use some glitter eyeshadow to make them sparkle. The Dollar Tree also sells foam fairy wands (though they don’t appear available for purchase on their website, but I took a picture of them at our local store). These wands are the perfect activity to let the kids decorate and get creative with, especially with these adhesive craft stickers. Another great activity is painting nails. Little girls LOVE having their nails painted so grab a few fun, fairy colors from the make-up aisle and maybe some loose glitter or press on rhinestones to accent their mini manicure. Another great activity is to make “Pixie Dust” necklaces. With these (found on the nail care aisle) and some pretty ribbon or twine, you instantly have a beautiful necklace for your guests to take home. And they come 8 per pack so they’re very budget friendly. The table decor is one of the staple items of any party. The Dollar Tree has tablecloths and dinner ware in nearly every color imaginable. Green, pink and purple would be the perfect color combination for a fairy themed party. Select one main color as the tablecloth. Purchase a second tablecloth in a contrasting color to use a table runner. Finish your table setting with color coordinating cups, napkins, plates and utensils. Setting each place gives a better overall look than leaving items at the food table. You can purchase extra fairy wings (or use the ones you will give to the guests) to tie to the backs of chairs for an added touch of magic. Alternatively, you can hang wings over the table. Mix in streamers or make tissue paper pom poms for an even grander look. You always, always, ALWAYS want to make your food presentation decor worthy. Don’t just throw a bunch of food on a table. Give your dishes cute names and decorate accordingly. The Dollar Tree has a ton of serving ware that can really give it a polished look. Add butterflies or flowers to the plates to give it a beautiful garden fairy inspired look. A few more tips to save money…. Keep your guest count low! Don’t invite your daughter’s entire class. Keeping it to 8-10 guests really makes the environment more enjoyable for you and the guests. Plan your party outdoors (if the weather permits). A fairy party is perfectly set against a natural background. The more you can use nature for decoration the less you have to spend to make the space look the part. Use what you have! If you have rustic decor in your home, use it! Does your daughter already have fairy toys, outfits, dress up clothes? Use them! The more you incorporate what you already have the less you have to spend. Happy planning! Hope your fairy party is flitterific! It has become a tradition to do “princess on vacation” pictures for the Fourth of July weekend. We try not to book any parties/visits that weekend so that everyone can enjoy some time off and spend it with their families. Each girl chose a character and designed her own bathing suit themed to suit the wig/accessories. This was the end result. Such a fun project! Photos by the talented Madi Mack Photography. Wishing you and your family a Happy and Safe Fourth of July! This ‘sweet’ themed party took place at Sweet Pete’s in Jacksonville, FL. The client wanted an entire candy themed party. I designed the custom labels for the centerpieces, goodie bags, place cards, water bottles and candy buffet menu tags. Party decor by Girly Girl Partea’s. We had a client request Jake the Pirate. After googling to see what the character looked like, it seemed easy enough to accomplish. Here is a basic tutorial on how I put the costume together. The vest was made from some stiff blue, linen-like fabric. I made the basic shape by using one of my husbands tank tops as a guideline. The vest was edged using yellow cotton edging purchasing from Walmart’s sewing section. The vest was completed with yellow buttons, two sewn to each side. The red headband was also purchased from a second hand store. It was a cotton scarf that I cut and frayed the edges of to look pirate worthy. Lastly, the boot covers were purchased on Amazon for $15. The performer wore his own blue jeans and brown shoes to complete the outfit. 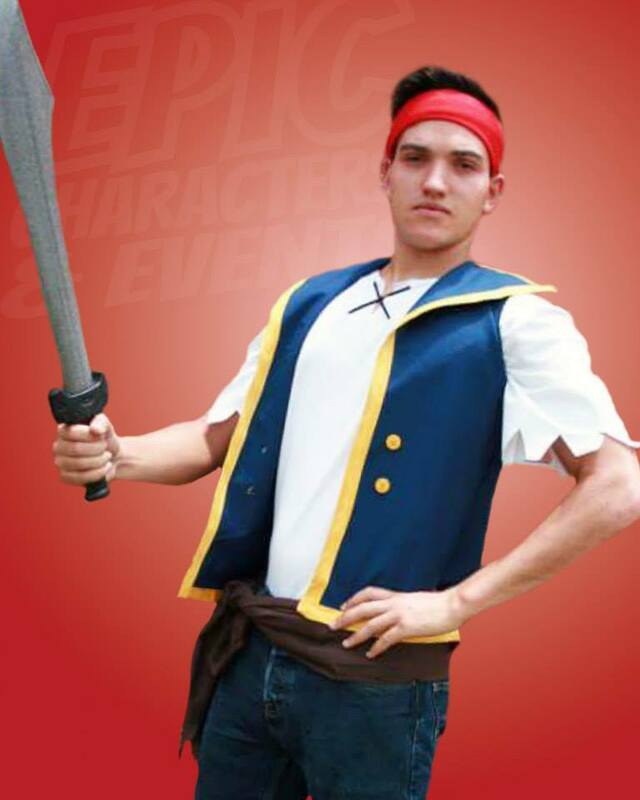 A pirate isn’t a pirate without a sword! This sword is foam and was actually purchased from the Dollar Tree. It had a bright green handle, so I used black electrical tape (also a Dollar Tree find) to wrap the handle and give it a more neutral look. For a last minute, low budget costume, I was quite pleased with the outcome. Have you made a ‘Jack the Pirate’ costume before? I’d love to see yours in the comments below. In preparing for the delivery of our little princess, it has felt like a never ending list of to-dos! Clean this, wash that, pack this for the hospital, leave that at home. So many lists! One of the things I really wanted to do was make little gifts for the nursing staff. Nothing too big of course, because with a new baby we are on a budget. But still something sweet and individual for the people who would be taking care of me and my precious baby girl for the short time we’re in the hospital. My aunt is a nurse and when I asked her opinion on the matter she said anything chocolate is a big hit and, of course, little individual gifts are so appreciated by the staff. I decided to make little baggies with two types of chocolate, Reeses and MnM’s. I purchased the candy from Walmart for less than $10, and still had plenty leftover for those late night chocolate cravings. While I know, without a doubt, that we are having a girl, I figured some readers may be having a boy or may not know at all (kudos to those moms who can wait until birth to find out, the suspense of that would kill me!) may want other color options besides pink. I have included the FREE printables for pink, blue and yellow if you would like to recreate these for your own use. Once printed, I cut the labels out, folded them over and stapled them to the bags. Super easy and quick! All together, I made 20 little baggies in less than 30 minutes.